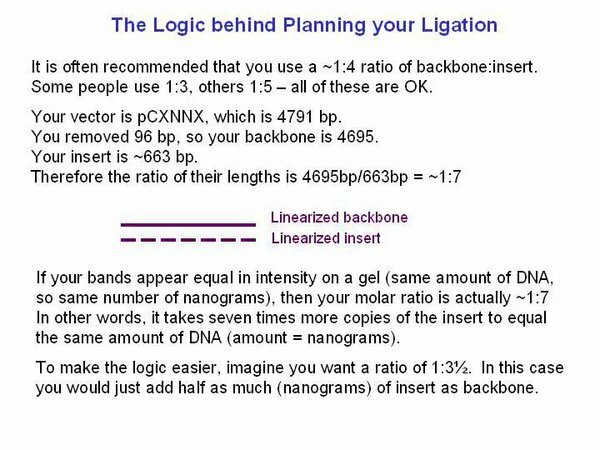 To help you through the logic in planning your ligation, please take a look at the attached slide. Note that for your homework the length ratio is described as 1:4 - this is my mistake, it is actually ~1:7. If you have already done your calculations based on the 1:4 ratio, it is fine to go ahead with what you have planned. Hopefully the slide below will help you think through the logic of how to set up a reaction with a reasonable ratio of backbone:insert (a ratio of 1:3.5 is fine!). This page was last edited on 27 February 2006, at 20:53.